Josh Kramer for The Cartoon Picayune: Your story mostly takes place inside the new Walter Reed National Military Medical Center in Bethesda, Maryland. The first page (above) is all exterior shots approaching the door. Were you struck by the building itself? It's an interesting choice, can you talk about why you wanted to begin that way? 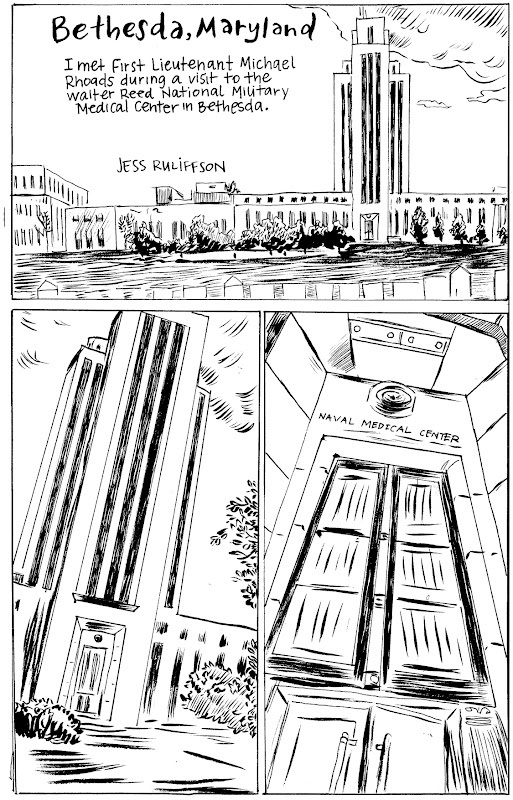 Jess Ruliffson: The current Walter Reed Medical Center was recently moved to the preexisting Bethesda Naval Medical Hospital, which was built in 1940--that's the hospital tower building that you see on the first page. [Ed. Note: Interested readers can learn more about Walter Reed from this Pulitzer Prize winning series that was in the Washington Post in 2008.] The old Naval Hospital is one of the only tall buildings in that area of Bethesda, and has a commanding presence up close. I was also pretty nervous on my first visit there. The trip documented in the comic was my second trip there, and that towering building became iconic to me. In looking back on the piece, I think maybe three panels of the same subject is potentially boring, but I can see why I did it. Talk a little about your experience with the Joe Bonham project in general, and then maybe why you decided to focus this piece on Michael. Mike D. Fay is an Vietnam vet and incredibly talented combat artist, and the founding member of the Joe Bonham Project. I met him and another illustrator, Victor Juhasz, though the Society of Illustrators in New York. Every year they have a juried exhibition, and the sequential category is relatively new and provides an outlet for really interesting work to be seen. Anelle Miller, who is currently the director there, introduced me to the both of them after my first veteran comic was accepted into the show. They told me that they were going to the military hospital at Bethesda and drawing portraits of the wounded, and I thought it would be a great way to hear more from veterans and potentially make a comic about the experience. The project was started about two years ago, with the intention of bringing awareness to veterans, specifically those wounded in combat in Afghanistan and Iraq. We've just had a second public exhibition of these documentary drawings in Washington, D.C. I focused on Michael's story because I knew it the best, compared to the other stories I'd heard. We (Ray Alma and I) were allowed to sit with him for maybe only twenty minutes and he was so patient and nice. His parents were very gracious, too. I was permitted to make an audio recording of his recollection of his injury and took some photos and was able to piece it together. I really liked showing how Ray and I reacted to hearing how recently he had been injured--we were so surprised to hear he'd been shot in Afghanistan about ten days before we met him. I love the page where Michael describes his injury (below). The light switch and growing black circle are fairly abstract, but it's an interesting solution to the problem of you not having been there for the most action-packed part of the story. Where you trying to convey a specific feeling? I was stumped on how to draw the scenario he's describing, when he described how he was injured during patrol. 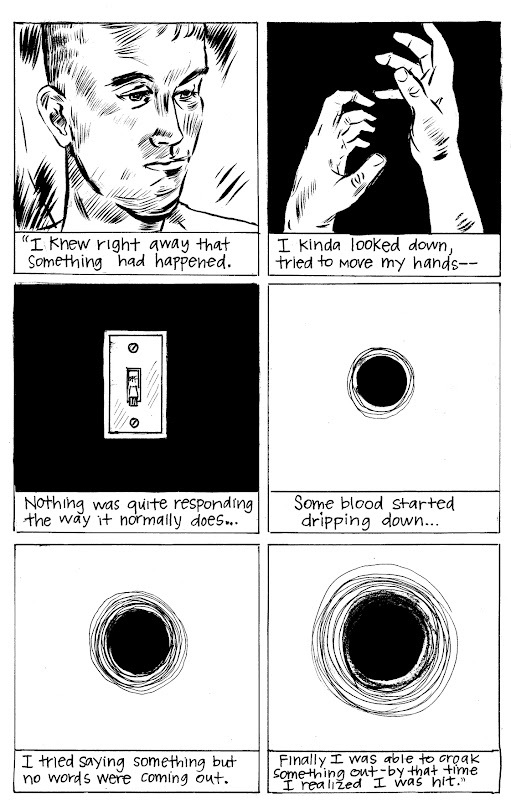 I think I was inspired by David Mazzuchelli's more abstract storytelling in the Paul Auster adaptation, City of Glass, he often would draw sort of non sequitur images. I also had my doubts on being able to get all the equipment and poses right in a part of the story I didn't have much else but a verbal reference on. I was trying to imagine what it would like to be in that situation, and my usual reaction to physical pain is panic. So the idea was to represent that panic and maybe time passing. I think your piece is really effective at conveying two ideas about modern warfare: many soldiers may be seriously wounded but don't appear to be on the outside, and that transportation to and from the battlefield is so, so quick now. What else did you learn that surprised you, and what would you want to tell people who haven't met a veteran? I was surprised to hear that Michael wanted to go back to war as soon as possible. If I were critically injured, I might want to stay home. He has a real bond with the other people in his platoon and really wanted to go back and be with them again as soon as he could. I was so shocked that he was recovering so quickly. Michael had a really selfless attitude. When he mentioned they guys in his platoon called him after 'the operation,' I assumed he meant the life-saving surgery he received at the field hospital or in Germany. But he was actually speaking about the guys coming back safely after the mission he was on. That really blew me away. Most of the people I've had the opportunity to speak with at the hospital have been making incredible strides in healing and recovery. I was also struck by Michael's gentleness and calm way of speaking. He was very peaceful. I think before I got interested in veterans' stories, I assumed most people in the military were really reckless and aggressive. I think that each soldier is very different, and they have more qualities to them than just being tough. They're highly intelligent and hilarious, something which doesn't get a lot of press. I think when the media talks about soldiers, the focus is on their superhuman strength, endurance and bravery, all good things, but there's a difference in how that bravery and resilience is expressed in a hospital room and in combat. 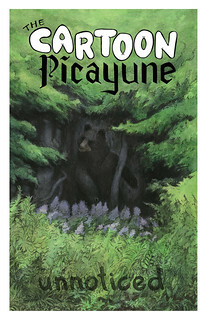 This may not be directly related to your piece in The Cartoon Picayune, but you recently returned from your fellowship at The Atlantic Center for the Arts, where you studied with Dean Haspiel. What was that like, and have you made any changes to your process because of it? The residency was definitely life-changing. It's so difficult to describe. I've been hanging out with several of the resident artists that are based in New York, and we can't stop talking about it, because the experience is so hard to communicate to other people. I learned a lot of practical stuff to last a lifetime, we got the chance to see Joe Rivera (of Daredevil fame) give an inking demo. He didn't go to art school but spent years doing caricatures, airbrushing, and motorcycle detailing. His technique was really incredible, he'd rest his drawing hand on top of his other wrist and use that arm to guide his marks. He's just brilliant. I learned so much from Dean Haspiel and Megan Kelso (another master artist at the residency) about storytelling and not getting discouraged and staying interested and not giving up. I also learned a lot from the other cartoonists studying at the residency. Everyone was so kind and really curious about other people's work and exploring everything. It's like we were a bunch of kids on a playground. It was a very high-energy scenario, no one seemed to sleep very much, everyone was always noodling away at a drawing at their desks. I've made friendships that I feel will be around for the rest of my creative career, I've never met such a devoted bunch of people. I definitely recommend the program to other comics artists, they're having another comics residency in 2014.